Home / events / launching / nova 3 / nova 3i / smartphone / New Nova 3 and Nova 3i now launched in the Philippines. New Nova 3 and Nova 3i now launched in the Philippines. Huawei finally unveils the predecessor of Nova 2i in the Philippines, The Huawei Nova 3i and Nova 3. The Nova 3i and Nova 3 both features AI quad-camera for better photography experience. It also has a bigger storage at 128GB ROM to store more pictures and videos. 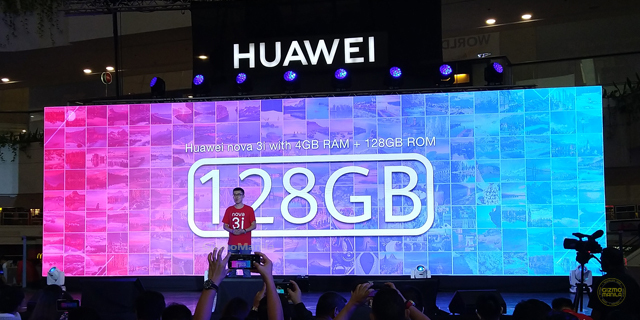 The Huawei #NovaStar launching event is held in Glorietta, Huawei turn its activity center into a one big experience area were you can actual test and try the Nova 3 and Nova 3i smartphone. At the event, they not only unveils the newest smartphones but also unveils their newest Brand Ambassador for the #NovaStar devices, James Reid. In 2017, the Huawei Nova 2i becomes the Mid-range smartphone of the year. And this year, a lot of people thinking that the Nova 3i would be the mid-range smartphone king this year. The Huawei Nova 3i is now available in Huawei Concept Store/kiosk. It will also available on Postpaid Plans on Smart and Globe. The FREE exclusive premium speaker promo is extended up to August 31, 2018. While the Huawei Nova 3 will be available for pre-order from August 4 to August 8, 2018, pre-order's are entitled to a FREE exclusive premium speaker worth PHP 2,990.